iPhone, iPod Market Distribution – Japan is Catching Up Fast! With 78 million units reportedly shipped by Apple, have you ever wondered where those iPhones and iPods are located right now? Mobile advertising company knows their geographic distribution and they just released a report showing this. According to the report, obviously most of the iPhones and iPods shipped by Apple are with U.S. consumers, 50% of the 78 million in fact. Now for the rest of the other 50% of the 78 million units shipped, majority of those are Japan, France, Australia and Canada. These countries are showing tremendous growth in terms of iPhone and iPod units being shipped and sold to consumers. 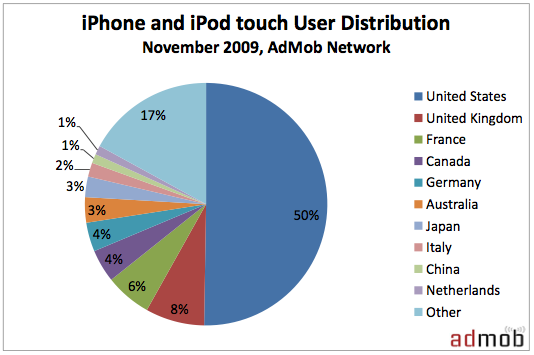 Interestingly, according to the AdMob data from Jan-Nov 2009, iPhone and iPod userbase growth in Japan surged to more than 300%. It looks like our friends in Japan are starting to love the iPhone and iPod music players this year. With reports that the Motorola Droid is catching up with iPhone sales, AdMob’s data just prove one thing – the Droid is still has a long way to go before it reaches the iPhone’s status. The Iphone is king. I have been working with these phones in a corporate environment for a while now, and they are even miles ahead any windows based phone. I think the Droid will soon be in the second slot behind the Iphone.